Ottawa based company Muraudio produces very unique electrostatic speakers. Their older omni directional model PX1 was on display in their room, but it was their newer model called the SP1($14,700/pair) that was playing when I visited. The SP1 combines a film panel with two pairs of cone woofers (one above, one below). 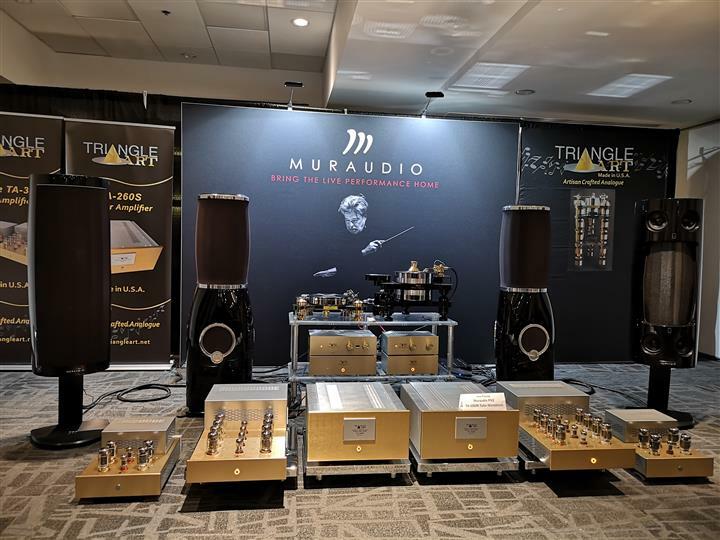 As with other recent shows, Muraudio were paired with a TriangleArt turntable and TriangleArt electronics from California. 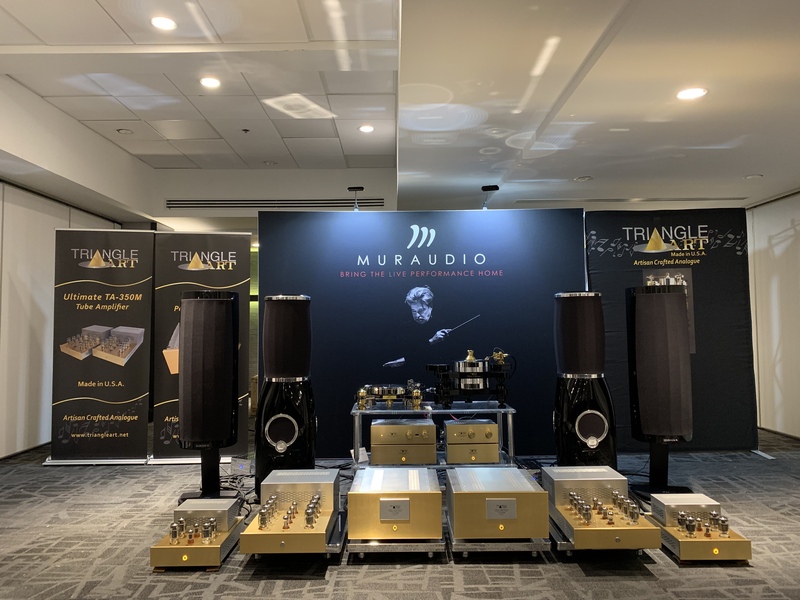 Amplification was provided by the TA200M Class-A monoblocks ($73,000), the Reference Tube Preamplifier ($18,995) and the Phono Stage($14,995). 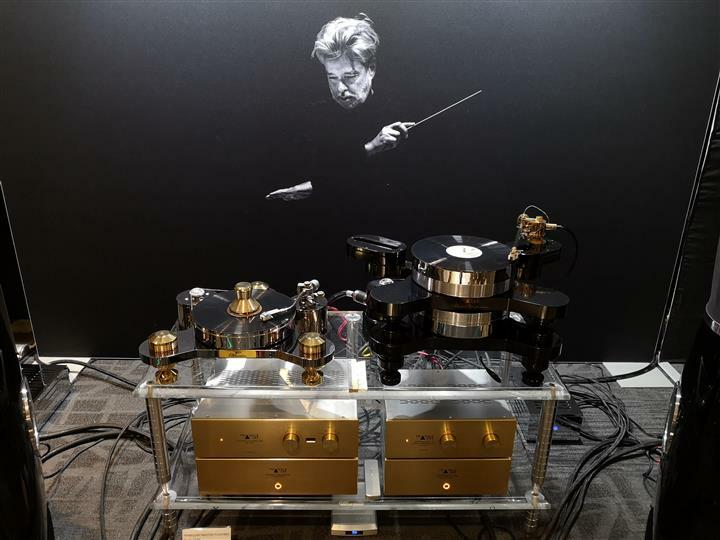 The analog source was the Master Reference turntable ($39,900) with an Osiris Mk2 tonearm ($6,990) and an Apollo MC cartridge ($8,000). I spent a considerable amount of time in this room as the sound was one of the best of the entire show. Initially, Tom Vu of TriangleArt played Nils Lofgren’s “Acoustic Live”. I know this record has become the stuff of jokes among audiophiles, but it’s such a great record with an amazing recording quality. Every guitar string pick and pluck was absolutely clear and felt authentic. The whole presentation was very musical and inviting. When one of the songs stopped and applause started, I fought the urge to clap along. Next, Tom played Hugh Masekela’s “Stimela”, which has always been my personal favorite. And again, I was amazed by the speakers’ ability to accurately present this amazing track with the clarity, power, dynamic range, imaging and staging that it deserves. And of course, the TriangleArt turntable and amplification were the perfect match.